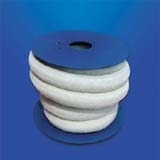 We manufacture a wide range of Ceramic Fibre Braided Rope which includes round, square & Rectangular shaped packing ranging from 6mm to 200mm in standard packing in several specifications. These are widely demanded in several industries for various applications such as sealing, caulking and heat insulating material on heat conducting systems and on thermal installations. These are widely appreciated their excellent durability and unique quality. Sterling Mfg Co was setup in the year 1992 in Ulhasnagar (Maharashtra). Under the able guidance of Mr. Sadashiv C. Shetty, the experienced Owner of the enterprise, the company has set a special position for itself in the industry. The company is known as a prominent Manufacturer and Supplier of Industrial Packings, Adhesive Tapes, Asbestos Cloth, Asbestos White Rope, Spiral Wound Gasket, and Teflon Packing Sheets.